The prize? 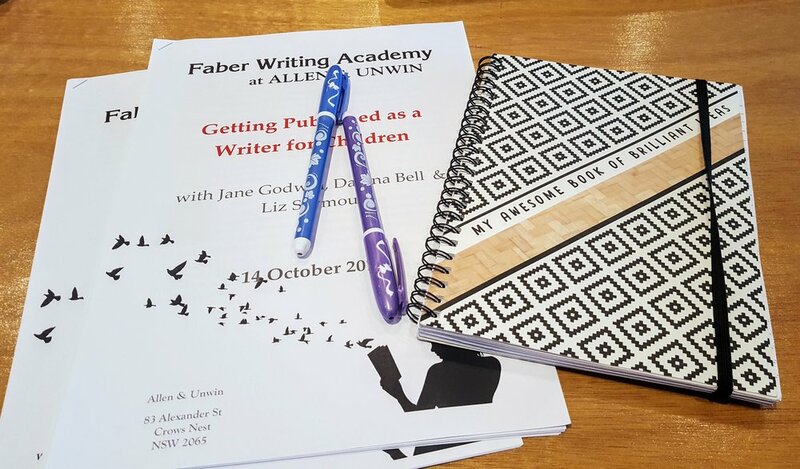 An amazing, wonderful, inspiring Faber Writing Academy course at Allen and Unwin. I attended Getting Published as a Writer for Children in Sydney on October 14, and it was one of the best writing courses I have ever attended. Relaxed, inspiring and encouraging, Jane Godwin (author and editor), our main presenter for the day, was so generous and warm, and I left feeling inspired to tackle the next challenges in my writing journey. I thought I might spill just a few more over here. Great stories have the right balance of originality and familiarity. In great stories, character and plot are intertwined, and the plot grows out of character. In great stories, main characters grow and change. To create great stories, have something you want to explore and share. Write what captures your imagination. Find your inner reason for your story. Great stories have a sense of the magical. Great stories don’t let the message override the story. Great stories have vivid, specific and immersive details. Get your voice into your submission letter/pitch because your voice is what is going to set you apart and make you stand out. Don’t be gimmicky but don’t be boring.